In 1977 a group of motivated business people, professionals, educators and clergy, spearheaded by the late Very Rev. Fr. 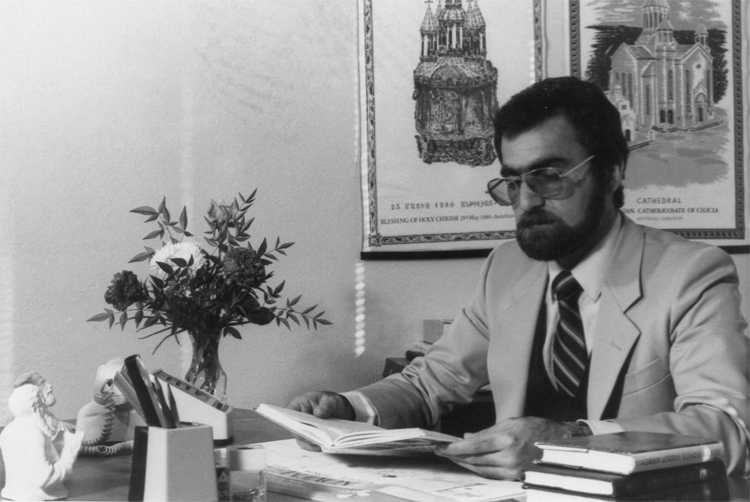 Kourken Yaralian, established the Armenian Community School of Fresno. Their mission was to provide an exceptional education to valley youth, while teaching Armenian language and culture. Since that time, the school has continued to instill in its students confidence and the foundations of learning to become productive citizens of the United States and the global community. After its first few years at the Holy Trinity Armenian Apostolic Church, the school had various other locations in Fresno. However, in 2007, Fresno native Charlie Keyan donated the necessary funds to purchase the land for the construction of a new and permanent campus. To honor this unprecedented monetary contribution, the voting members of the school’s Annual Assembly voted unanimously to rename the school in his honor. Our beautiful campus is located on Villa Avenue between Herndon and Sierra in Clovis, California, adjacent to Fresno. Currently 112 students attend CKACS, from 2 years old in the Pre-Kindergarten classes, through 6th grade. Qualified teachers assist each student to excel and develop to his or her potential. Class sizes are held to a maximum of 20 students. Each classroom is housed in comfortable portable classrooms. Each of the classrooms K-6th grade classrooms have a Promethean Board which is utilized by teachers and students. Students from fourth-sixth grades work on the Chrome books. Students in third grade have laptops. Kindergarten through second grade classrooms each have four laptops to use. Classroom instruction is in English. There are qualified Armenian language teachers (both Eastern and Western Armenian) who instruct students each day for 45 minutes to one hour the Armenian language and culture lessons. All students participate in weekly choral and instrumental music lessons with qualified instructors. The students also take part in an art program once per week, taught by an art instructor. Christian Education is taught weekly, as well. Our After School Academics and Enrichment classes enrich the knowledge and experience of students. The school nutrition program serves delicious hot meals every day. The menu is planned with the help of a nutritionist and is evaluated each month to make sure children are eating a healthy meal each day. Students participate in the Private School Spelling Bee, CSU Fresno Peach Blossom Festival, CKACS Science Fair, Writer's Roundup, Art Exhibits and numerous community events. The CKACS Student Council plans activities for all students throughout the year. They learn how to plan and execute many enjoyable events for the student body. Parents are an integral part of the CKACS program. There is an "Open Door" policy for all parents to take part in Back to School Night, Parent Conferences, Parent Participation Hours, Parent Forums, Annual Assembly, and numerous major fund raisers (e.g., Holiday Gift Packs, New Year’s Eve Party, Crab Feed, Annual Banquet, Heritage Night, International Night, etc.) Parents are always welcome, and strongly encouraged, to visit the classrooms as often as they would like. The CKACS Board of Education, composed of nine members from the community, are elected for three year terms to oversee the school facility and programs. Along with the school principal, they bring their respective talents to serve the needs to sustain and improve the quality of educational services to the student body. The Women's League of the Charlie Keyan Armenian Community School is an auxiliary organization that unites women from all segments of the community who are interested in both education and Armenian culture, and sponsors events and activities which financially benefit our school. As the school continues to grow and evolve into its fourth decade, the principles of its founding fathers continue to guide the development of our school.